Punk rock has only one vice: itself. Almost as quickly as it emerged, punk was known by anything other than punk, becoming one of the first genres to be successfully outweighed and overshadowed by the number of sub-genres it contained. While Oi! was an attempt at punk unity, it seems post-punk was a healthy acknowledgment that it was merely a stepping-stone to something better. 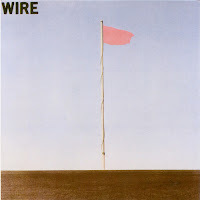 Wire's 1977 post-punk classic Pink Flag was widely-influential upon the sub-genre, appearing a year before the earthquake that officially devoured punk rock forever, set off by Joy Division's Unknown Pleasures. Wire stuck a little more to the formula, keeping the 'punk' in post-punk, but all that would change with their 1978 follow-up album, Chairs Missing. Pink Flag is a death knoll, rung furiously by the emergent sub-genre that followed all too closely on the heels of punk rock. It's the soundtrack that voraciously springs to life after Clint Eastwood pulls the trigger on his unloaded .44 Magnum in Dirty Harry. It's just what you get for asking, "I gotta' know." Though highly influential on the alternative genre still to come, Pink Flag was poorly-received by the DIY punk scenes of New York and the UK, mainly as it was released on the major British label EMI. The album also relied heavily on a classic rock structure to it's 21-song barrage, and saw some of the first hints of a dance-punk integration, which shortly after became a sub-genre itself. In other words...Pink Flag isn't as much a brick in the wall of punk rock as it is the pariah that cast the first stone into the establishment for anti-establishment. You've got to ask yourself one question - do I feel lucky?